HURRICANE MILLS, Tenn. — The 37th Annual Rocky Mountain ATV/MC AMA Amateur National Motocross Championship, presented by Lucas Oil, continued to host second motos on day three of racing on Thursday, August 2. There were total of 23 gate drops for the third straight day of racing at Loretta Lynn Ranch in Hurricane Mills, Tennessee. 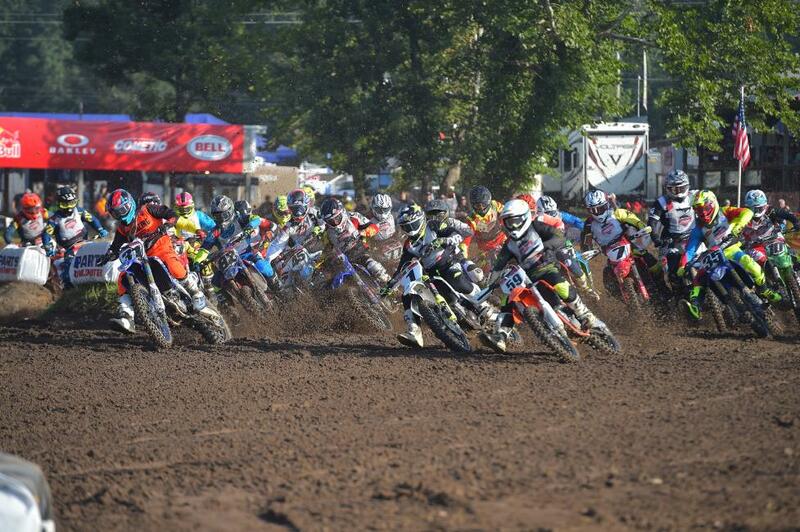 The 250 C moto two kicked off the day at 7:30 a.m., with David Dabin earning the first win of the day. Dabin sits ninth in the overall standings after a 24th-place finish in moto one. Currently leading the way in 250 C is Dustin Renteria with 3-4 moto finishes thus far in the week. Cole Jones finished second in the class, but after a misfortune in moto one, Jones sits just one spot out of the top ten overall in 11th. Tyler Uenaka sits third overall after earning an eighth in moto one and a third place finish in moto two. Leading the way in the Junior (25+) moto was Ricky Renner, followed by Michael Brown and Levi Kilbarger. After earning the win in moto one, Brown was unable to apply the pressure to Renner in moto two. Renner earned the win by 29.32 seconds and took the lead in the overall standings. Junior (25+) will crown a champion tomorrow after moto three at 4:00 p.m. CDT. Kilbarger held onto the third place position in moto two, while Brad Smith finished fourth and James Roberts rounded out the top five. Jazzmyn Canfield jumped out to the early lead in the Women (12+) class, but Jordan Jarvis was hot on her heels as they came around on the second lap. Jarvis made the pass and took over the lead without hesitation. 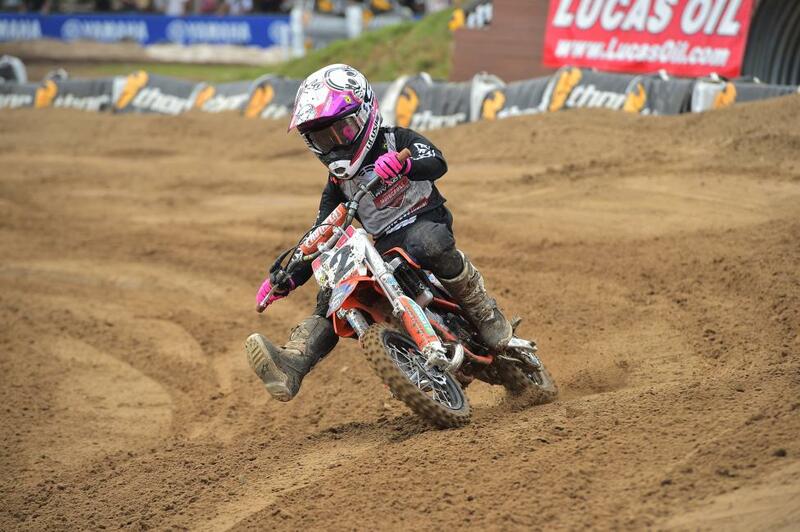 Tayler Allred found herself in the third-place position throughout the course of the second moto, with Katie Benson making her way to a fourth-place position after starting the race in tenth. Jarvis earned another moto win in the Women (12+), where she now holds first overall, with Canfield and Allred rounding out the top three. The Senior (40+) class was dominated by Michael Brown during the second moto. Brown once again jumped out to the early lead and never looked back. Behind Brown, John Grewe and Gregory Pamart were battling during the opening laps for the second-place position. Grewe would make the pass stick during lap four, and Barry Carsten would follow pushing himself up into the third-place position ahead of Pamart. Edward Walston remained in the fifth-place position for the second moto. With just one moto remaining, Brown leads the way with a pair of first place finishes while Grewe and Carsten sit second and third, respectively. Justin Rodbell jumped out and earned the Bell Helmets holeshot award for the Open Pro Sport moto two. Derek Drake was quick to make the pass on Rodbell for the lead and continued to push throughout the moto, ultimately crossing the finish line seven seconds ahead the rest of the field. Mitchell Falk worked his way through the pack on the first lap to take over the second-place position. Seth Hammaker made his way up to third place on lap two, where he continued to try and catch the top two before the end of the race. Falk and Hammaker would round out the podium for moto two, with Ciaran Naran and Tanner Stack finishing fourth and fifth. In the 125cc (12-17) B/C, Gage Linville led the way on the opening lap, but it was Orion Gregory taking over the number one spot for two more laps before Aiden Tijero made his way up to the front. Tijero would lead the moto until the white flag flew, but a last-lap crash would end his hopes for the moto win. Linville would briefly hold the lead until a bobble let Ty Masterpool past just before the finish line. 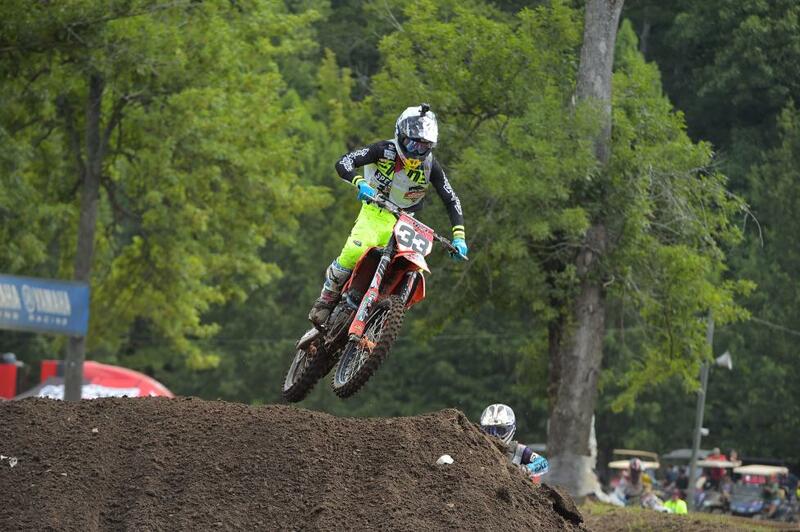 Masterpool would work his way from a 16th-place start to take the moto two win, followed by Linville and Levi Kitchen. Devin Simonson and Parker Mashburn would battle for the 450 B Limited moto two win. Simonson would manage to hold down the first-place position for the first four laps until Mashburn made the pass. Mashburn would hold onto the lead until the checkered flag flew, while Simonson would hold on for second place. Cristian Fernandez made his way up to the third-place position, with Tristan Lewis and Eugene Christian III rounding out the top five. 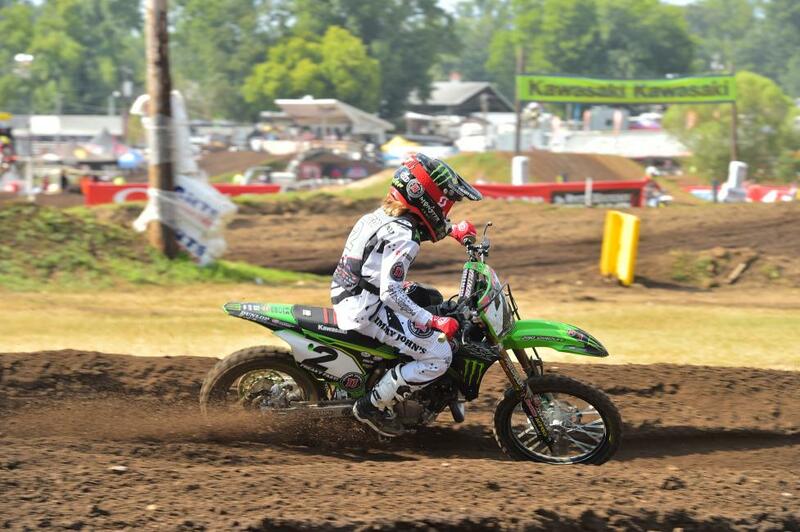 As the 85cc (9-12) riders took to the track, it was Ryder Difrancesco who got out to the front of the class. Difrancesco lead from the beginning of the moto until the end, but the battle was on behind him. Chance Hymas started in the sixth-place position, but he managed to work his way up to second by lap five after battling for the spot with Daxton Bennick. 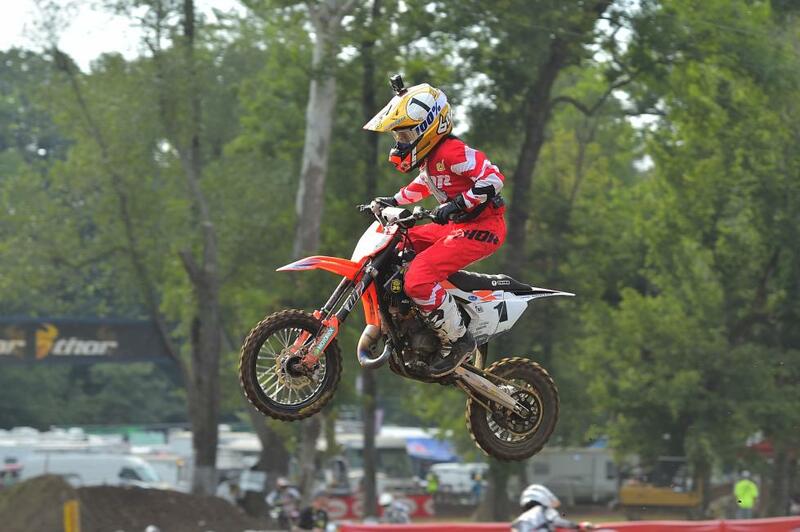 Casey Cochran remained in the fourth place position throughout the moto, followed by Collin Allen in fifth. The last race of the day was the 250 B Limited class, where Carson Mumford controlled the moto from start to finish. Mumford earned another win at The Ranch after earning the moto one win, placing himself in good contention for the National Championship. Tristan Lewis made his way to the second-place position, followed by Tre Fierro and Kayden Palmer. The 250 B Limited Champion will be crowned Saturday afternoon after their third and final moto. Day four of racing will continue today, Friday, August 3, finishing up the second set of motos and continuing onto the third motos, where champions will begin to be crowned. RacerTV continues with live streaming coverage beginning at 9:30 a.m. EDT/8:30 a.m. CDT. Wednesday's archived coverage is now available on RacerTV.com, to view the racing action from day one, please click here, while complete results from the National Championship can be found here. For more information on the AMA Amateur National, visit the series' official website at www.mxsports.com or call (304) 284-0101. Join the conversation on the event's social media channels, along with receiving the most up-to-date news and exclusive content.